Here is the dish which is great to whip up quickly in a busy morning. 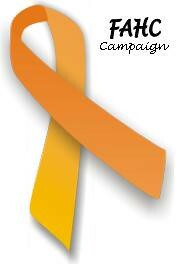 I have used brown rice flakes as a healthier alternative. Soak the poha after washing it thoroughly for 10- 15 minutes. Drain the excess water . Cook potato in a cooker with salt needed and dice it. Heat oil in a pan, throw in mustard, urad dall, gram dall, chili, ginger and curry leaves. Add onions and when they turn translucent , add potato dices , salt and poha , give a gentle stir and turn off the heat. Cover it for 5 minutes . Add some asafoetida and garnish with finely chopped coriander /cilantro . Have a great time cooking! As every weekend comes by, I start with a desire to bake something , then get distracted with other handful of hobbies (hehe..) and look forward to another weekend all over once again . Last weekend was something different, our neighborhood Nilgris got renovated and restocked with fresh ingredients. We came across chocolate chips and baking chocolate bars. There started the desire to bake some muffins to stock for breakfasts. It was Sunday morning and I wanted to surprise the kids. Followed this recipe with mild modifications. Preheat the oven to 210 degree celsius. Mix all wet ingredients well and add in flour and rest of the dry ingredients (Hold the chocolate chips ), beat until the batter is smooth and without lumps. Line your cupcake molds with oil/ butter, fill it upto 2/3. Place it in a baking tray / metal plate , place them on a rack so they are in the middle of the oven to ensure even baking. Bake for 20 plus minutes, know the doneness by poking in middle of the cups. 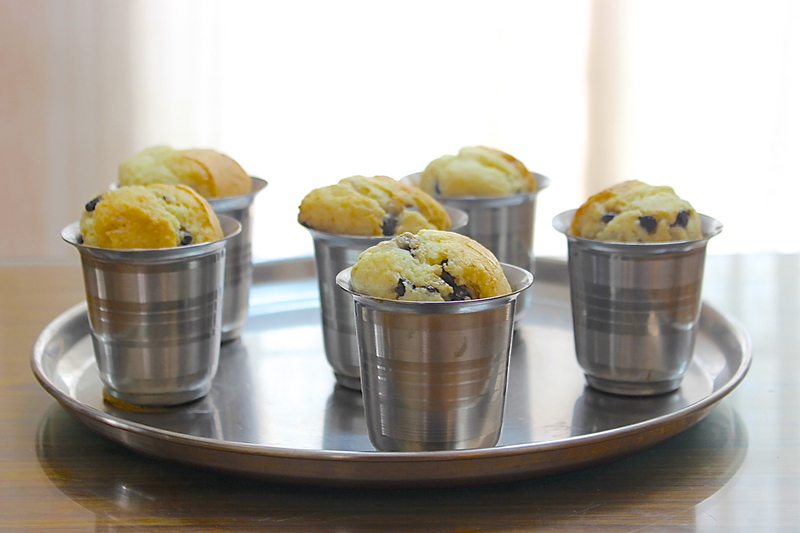 The muffins were warm and welcoming , that it did not last past 10AM, so, when you plan to make these lil muffins, expect them to magically disappear. First meal of the week..
Pongal is a rich and healthy food . It is a famous breakfast served in marriages. With no further ado..lets see the ingredients list. By the time , you gather these …I like to show case my handmade gift for one of our friends. 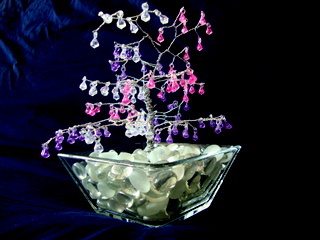 It is a crystal tree. Back to the cook show ……..
Measure out the dall and rice. Wash the rice. In a pressure cooker, dry roast a little bit the dall. When you feel the raw smell is gone, add water, rice and needed salt and cook till a whistle. Alternatively, you can cook in any vessel covered till all water is well absorbed and the rice is well cooked. To do the tadka, heat the ghee (for diet conscious ..use mixture of oil and ghee), sputter the peppercorns, cumin and ginger and curry leaves. Dash the asfoetida after the turning off the stove. Add cashews if you want to make it extra rich. Mix this to the rice and serve warm with sambhar or chutney. The key is to slightly roast the dall and cook the rice really well. Enjoy (y)our first meal of the week! Have you ever had the joy of acheiving that you had dreamt for a long time? I read here that the ‘user experience pleasures’ are of thirteen types and I experienced today two such types of pleasures – triumphant (The joy you experience when you win ) and accomplished (The joy you get by accomplishing or acheiving something). I had been dreaming of baking muffins from scratch for a long time and this show on Food network TV made my dream come true. I modified a little in the sweetener and added almonds on top so as to pack it easily for my daughter’s lunch, but it didn’t last that long. I was so enthusiaistic to post this earlier than the dishes in my ‘waiting list’ but then Maheswari of ‘Beyond the usual’ has started hosting a new blog event called AFAM (A Fruit A Month) giving me better reason to post it immediately. Maheswari has chosen the fabulous banana for this month which is said to be one of the mukkani (meaning three fruits in tamil. Banana, Mango and jackfruit are the three fruits served in a traditional festival meal in Tamil Nadu and so called mukkani in short). So, here is my entry for the fruit mela ! Mix in these dry ingredients in a large bowl. Preheat the oven to 325 degrees F. Beat the sugar, oil, eggs, and vanilla extract in a large bowl to blend. Stir in the banana. Add the dry ingredients and stir just until blended. Pour the batter in the greased muffin cups to 3/4th of the height. Sprinkle chopped almonds on top. Bake the muffins on the middle rack for about 25 minutes. Test for doneness by inserting a toothpick in the centre of a muffin. It should come out without any crumbles . Enjoy the warm banana muffins! I was preserving one of my mom’s best dish for the new year . Oh ,what a pity, my modem went wrong on the new year day , just 10 days after its warranty period. Can you imagine? I spent 9 full days without browsing the blogs . mmm mm ….. That was good in a way. I could look at my daily routines in a different way. Coming to the treasured recipe , this kurma (but we call it kuzhambhu) is perfect for Idlis. My brothers call it ‘duplicate kari kuzhambhu’, as it is much spicy and the taste immitates mutton kurma. (They eat meat.) For a vegetarian like me , it is like a feast to have it with steaming idlis. Though, almost every one of the Indian bloggers has posted this, I feel it is good to share my mom’s secret for a ‘malli poo idly’. Yes, my daughter used to describe my mom’s idly this way , meaning it is as soft and white as jasmine flower. Wash the rice twice and soak it with fenugreek seeds for 2-3 hours. Wash the dall twice and soak it separartely for half an hour to one hour. Grind the dall first. Add minimum water and sprinkle ice cold water for better frothing. The grinder should run for atleast 30 min. Take the dall out and grind the rice next. When the rice is little coarse, add enough salt , unload and mix well with your hands. Make sure the batter has the right consistency before fermenting. If you pour the batter from your hands, it should run down smoothly and slowly. After a thorough mixing, let it stand for 10- 12 hours. The batter would have risen good if it was in right consistency and had the right amount of salt. Mix again well and pour in the idly molds and steam cook for 15 minutes. To check the doneness, just touch the idlis and they should not stick to your hands. Take out the molds from the stand and let it cool a while. Dip a spoon in water and use it to unmold the idlis. Hot and soft idlis are ready to be served with chutney, sambhar or kurma. 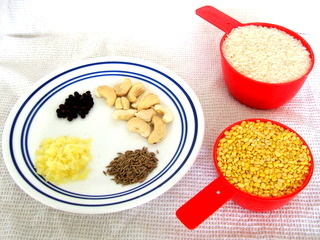 * The ratio for rice and urad dall varies with the variety we use. * Also it is true that if it is an aged dall and rice , it yeilds more batter. * My mom has the conventional idli steamer, in which she covers the mold plates with a wet white cotton cloth instead of greasing with oil. It is my belief that it is the cloth that gives the ultra softness to the idlis. * You can store this batter even for a week in the refrigerator, but always bring the batter to the room temperature before steaming for better results. * The consistency and salt are the key factors for a perfect idli. If the batter is watery, the idli will not rise on steaming, on the other hand, if it is thick, the idli will be hard. * You can store the cooked idlis in the refrigerator. When needed, steam it again in the cooker for hot and refreshed idlis. To reheat the idlis in the microwave oven, simply wet the idlis in running water, place them as a layer on a microwavable plate and cover with a wet paper towel and heat them for a couple of minutes. * For a different redo of the idlis, crumble them and do upma . 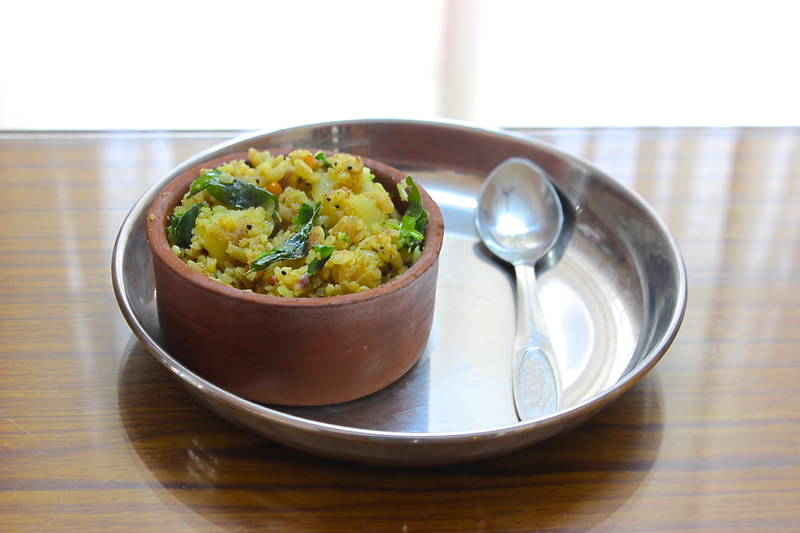 Find here a lemony version of idli upma . Finely chop the potato. Take the ingredients in the ‘to grind’ list and grind with little water and make as a coarse paste. Heat oil in a non stick skillet, sputter fennel seeds, add the ground paste, keep stirring continuously till the raw smells fades away. Once the masala is sauted well and oil oozes out, add the chopped potato and stir slightly. Add enough water and salt according to taste. You can test the spice level at this point. Transfer the contents to a pressure cooker and cook till you hear the first whistle. The curry thickens very well after cooking . If it is too thick , dilute with water and bring it to another boil. Note: If you hesitate to use the liberal amount of oil asked for, the chana dal will stick (even) to the (non stick) pan and get burnt , spoiling the whole taste. Also stirring continously is as important as the oil. Go ahead and try this, I am sure this will be in your favourite list soon. As Gini wanted to know, I am adding a picture to illustrate how to line the idli mold with damp cotton cloth. When I read the word ‘endangered recipes’ in the FAHC announcement, the first dish I thought of was ‘kali'(களி). 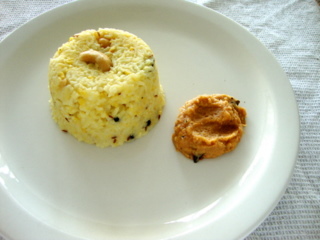 Kali is a ball made with ragi -rice mixture and koozh (கூழ்) is the porridge form of it. I have heard that my grandma used to make this for our farm workers in a large scale. She used a tennis bat shaped wooden tool to make the balls and would use her other hand to shape the steam hot balls. That was a time when rice was considered to be a luxury food for the common man. So, if it is your lucky day, you get rice added in your kali or else it is just the ragi cooked and shaped as balls. (This is called the orumavu kali). The time changes, the scenes have changed and now even my mom does not know how to do this kali and everytime my neighbours do it for us, as we (my brothers and I ) love it. Though my mom know not how to make them, she will be always in the tug of war with my brothers and me to share the kali. And we purposely preserve a ball for making the ‘piece of heaven ‘ porridge, called koozh in tamil. I learnt this dish from my husband’s athai (father’s sister) who taught me a lighter technology to get the same great taste. Wash and soak the rice for 1/2 hr. In a large pot, boil about 3 cups of water, add rice and let it cook well. When it is cooked, add ragi flour as a heap with salt and cover with a lid. Let it cook for another 5 minutes. Using a wooden spoon stir continuously and vigorously, without letting any lumps to form. When the mix comes together, turn off the heat. Take a stainless silver / nonstick bowl , sprinkle a tablespoon of water (this prevents the kali sticking to the sides ), drop a big scoop of mix into. Swirl it fast to give the ball a good shape.Transfer to the serving dish. Serve with a dallop of ghee (optional) and keerai (spinach dall – recipe follows..) /inji poondu kuzhambhu / varutha paruppu kuzhambhu. There are other ways of doing this, yet this is easiest , atleast to me. Soak the ragi balls (cooked as above) in water over night. The balls need to be just covered in water. 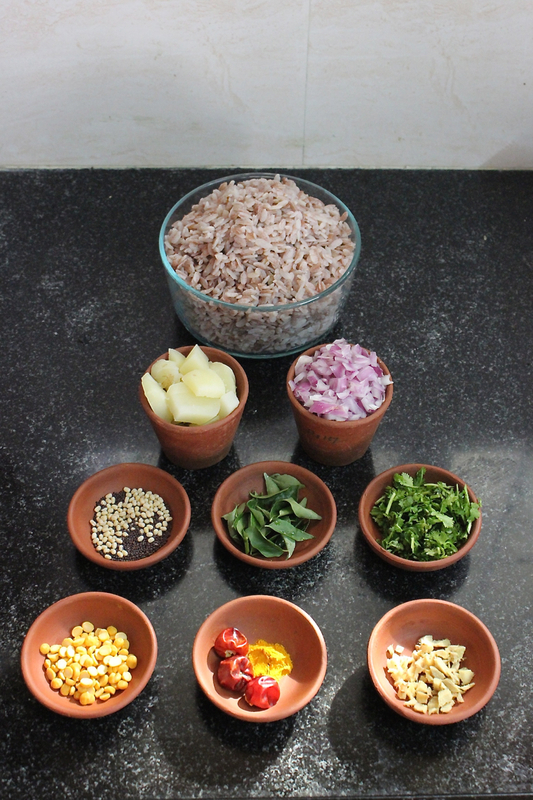 In the next day morning, using your beautiful hands homogenise (a great technique we use every day to make rasam ) the balls, adding yogurt/ buttermilk and salt according to your taste. Adjust the thickness to that a smoothie. This energy drink could be as such taken, but always we add some attractions like lemon pickle/ raw pearl onion/ fresh peanuts. As fresh peanuts were not available, I soaked the dried peanuts overnight and added to the koozh.